Think you have to choose between misaligned, crooked teeth or a mouth full of metal? Think again. The team of dentists at Edgewater Dental Group offer competitively priced Invisalign® teeth alignment treatments. If you want a beautiful smile without the hassle of braces and are in or around Chicago, Rogers Park, Edgewater, or Andersonville, Illinois, call or book an appointment online today. Invisalign is an innovative new way to straighten teeth. It offers a great alternative to traditional teeth-straightening treatments like braces. Your teeth are progressively aligned over time thanks to clear, plastic aligners that fit over your teeth. It’s best to wear the aligners for at least 20 hours per day, but they can be removed for easy eating and teeth cleaning. While you’re not eating or brushing your teeth, the Invisalign aligners should remain in your mouth. Invisalign is an increasingly popular means to fix poorly aligned teeth, especially among young adults, due to its ease of use and comfort. Not convinced quite yet? Here are the benefits of Invisalign over braces or other traditional orthodontic approaches. People want to see your real teeth, not a mouth full of metal. Thanks to the smooth plastic, you won’t get the mouth irritation sharp metal braces causes. You can easily remove the aligners whenever you need to eat, brush, or floss. With Invisalign, you can expect to see results up to 50% faster than with other orthodontic techniques. 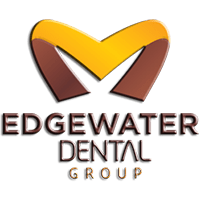 For major alignment and orthodontic issues, a different treatment may be recommended by your Edgewater Dental Group dentist. Book an appointment to find out if Invisalign is right for you. First, your dentist examines your teeth to determine whether Invisalign is right for you. They might either make physical impressions of your teeth or create 3D images of them using a digital scanner. Using these, your dentist develops a precise treatment plan. After this step, your dentist customizes plastic aligners to fit over your teeth. While you wear them, the aligners gradually push your teeth where they are supposed to go. As your teeth begin to shift, new aligners may be made. This process continues until your smile is just right. Talk to a dentist at Edgewater Dental Group if you want to straighten your teeth with competitively priced Invisalign aligners starting at $2,499. Call or book an appointment online today.